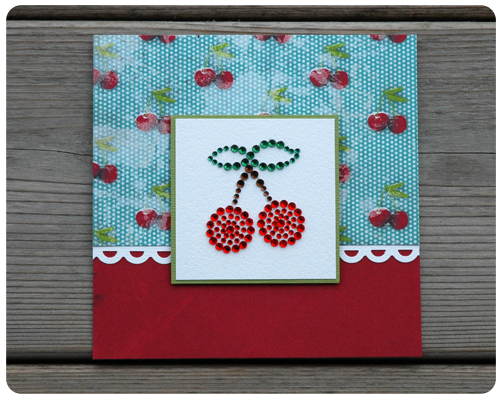 This week I made cards with the most adorable cherry paper. The cherry paper, the jeweled cherry embellishment - there was no doubt in my mind that these two things belonged together. Could it be more perfect? I don't think so. I tried adding a sentiment to this card, but it just did not work. So it stayed blank, making it ready for any occasion. With the small pieces of cherry paper that were left on my table, I made these two small note cards. I absolutely love this paper - so fresh and cheerful. In addition to these cards, I also made a scrapbook layout with this paper. You would not believe how perfect it was for the pictures I wanted to scrap! Please check back later in the week to see my page. LOVE you cherry cards. I missed these on Monday. Glad I saw them. Thanks Leslie. And thank you for coming back week after week to look at my cards - I really appreciate it. Thank you Kathy. I really enjoy sharing at A Bouquet of Talent each week and seeing the talents of so many others...thanks for hosting. I would love to know the name of that paper. Did it come in a stack? The paper is from the Cashmere Dame Collection by Glitz. It is available as a 12x12 sheet (which I had) and is also available in a 6X6 pad. Hope that helps. Thanks for reading.